Background/Aims: Esophageal squamous cell carcinoma (ESCC) is the most aggressive type of cancer. Mutation of tumor suppressor gene p53 is observed in many gastrointestinal malignancies including ESCC. The immunohistochemical protein expression of mutant p53 has been proposed as a potential tool to evaluate the biological behavior of ESCC. 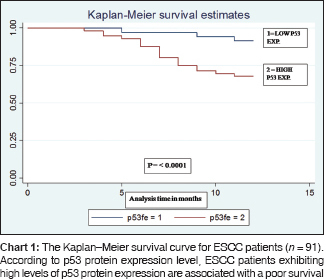 Predictive value of p53 for survival is debatable, hence this study was formulated to know the survival of patients with p53 expression in ESCC. Patients and Methods: We prospectively included 91 consecutive patients of ESCC from August 2014 to August 2016. Biopsy specimens were treated immunohistochemically and expression of p53 gene was analyzed by Immunoreactive Score (IRS). These findings were then compared with clinicopathological parameters such as age, gender, histological grades, and TNM stages. All patients received treatment and were kept under regular follow-up. Results: M: F ratio was 2.03:1. p53 expression analyzed by IRS showed low expression (score ≤6) in 35 patients (38.46%) and high expression (>6) in 56 patients (61.54%). Level of p53 expression increased significantly with increasing histological grades of ESCC and TNM stage (P ≤ 0.001). Multivariate analysis shows p53 expression as independent predictor of survival. After 1 year of follow up, survival in the p53 high-expression group was 67.86% [standard error (SE) = 0.0473, confidence interval (CI) = 0.75–0.97) and in low p53 expression group was 91.43% (SE = 0.06, CI = 0.53–0.78) with statistically significant difference P = 0.0001 when analyzed with Kaplan–Meier method. Conclusion: Expression of p53 correlates with the survival and is a simple, effective and reproducible modality to determine the prognosis and survival in ESCC. Esophageal cancer is classified into two major histological subtypes, namely squamous cell carcinoma and adenocarcinoma. 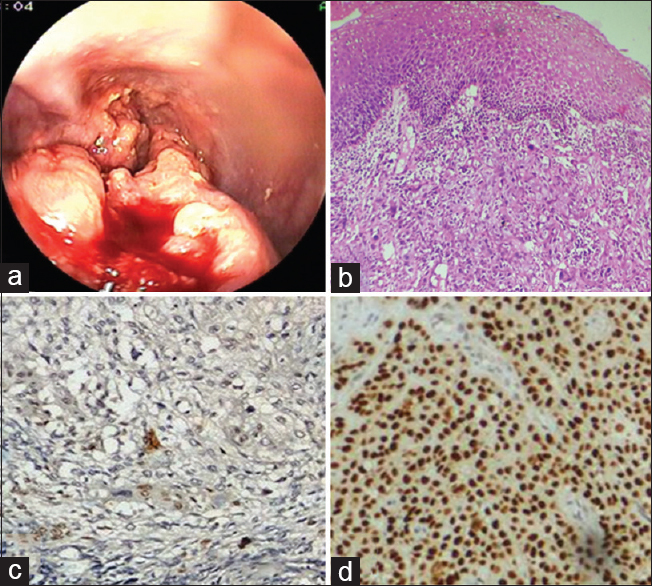 Esophageal squamous cell carcinoma (ESCC) is the predominant histological subtype. Prognosis of ESCC is poor as patients generally consulted health care services in an advanced stage of disease. Prognosis and survival depends on early diagnosis and treatment. Cancer is an abnormal growth of cells which might be due to a defect in cell cycle regulation. Cell cycle checkpoints regulate the cell cycle and maintain the genomic integrity of the cells during DNA replication. Deregulation of the cell cycle leads to tumorigenesis. Genetic and epigenetic changes affecting cell cycle regulating genes are the major events during carcinogenesis. p53 (p14/MDM2/p53) pathway is one of the major cell cycle pathways involved in cell cycle regulation. Genetic and epigenetic alterations in this pathway lead to inactivation of these genes, thus leading to uncontrolled proliferation of damaged DNA, which turns into cancer formation. p53 pathway is frequently found to be mutated in ESCC. It is well known that these mutations can lead to an increase in expression of p53, which accumulates in nuclei and can be detected by immunohistochemistry (IHC) methods. The immunohistochemical protein expression of p53 has been proposed as a potential tool to evaluate the behavior biologically. Majority of studies suggest a prognostic significance of p53 expression in esophageal cancer, however, controversial results do exist.,, These conflicting results led us to formulate the study for assessing the yield of p53 expression in ESCC and its relationship with survival. This was a prospective study carried out at the Department of Gastroenterology, Government Medical College and Super Speciality Hospital, Nagpur, India. The study protocol was approved by our Institutional Ethics Committee (approval no: 762/EC/Pharmac/GMC/NGP). The study includes 91 consecutive patients of squamous cell esophageal carcinoma who were diagnosed by the use of endoscopy [Figure 1]a and histopathology [Figure 1]b from August 2014 to August 2015. Patients were followed prospectively for 12 months (or till August 2016) and/or death from the date of enrollment. The overall survival in our study was defined as duration of survival to 12 months and/or death. After fixation in formalin biopsy, tissue specimens were embedded in paraffin and were sent for IHC. The following parameters were evaluated: age, gender, tumor location, tumor size, TNM staging [according to American Joint Committee on Cancer (AJCC)] using computed tomography scan of thorax and upper abdomen, and histopathological grading according to World Health Organization classification. All patients received standard of care treatment according to the stage of disease. IHC was performed on tissues fixed in 10% neutral buffered formalin. The sections were cut serially to 5 μm for immunohistochemical staining. Peroxidase detection system (streptavidin-biotin detection system HRP-DAB; product code: RE7110K, Novo-castra kit) was used. Endogenous peroxidase activity was blocked by treating hydrated sections with 3% H2O2 in methanol for 30 min. The slides were heated in a microwave oven for 10 min in 0.01 M sodium citrate buffer (pH 6.0) for antigen retrieval and then bench cooled for 20 min and the same cycle was repeated again. To prevent nonspecific reactions, sections were incubated with 10% serum for 10 min. Prediluted p53 antibody (Clone DO-7; product code: N1581, Dako, Denmark) was incubated at room temperature in a humidifying chamber for 60 min and then at 4°C overnight. Known tissues of carcinoma showing good p53 expression were used as a positive control. This was followed by incubation with secondary biotinylated antibody and streptavidin-peroxidase reagent at room temperature in a humidifying chamber for 30 min. Freshly prepared substrate/chromogen solution of 3,3′-diaminobenzidine (DAB) (mixing 5 ml of concentrated DAB in 50 ml of substrate buffer) was used to detect the antigen–antibody reaction. Finally, the sections were counterstained in Mayer's hematoxylin. The IHC staining of mutant (MT) p53 was assessed according to the Immunoreactive Score (IRS) [Table 1a] and [Table 1b], which is based on the percentage of positive cells and the staining intensity. The cells were considered positive for p53 antigen when there was an intranuclear DAB staining (brown color) [Figure 1]c and [Figure 1]d. The percentage of positive cells was assessed with the help of labeling index (p53 Labeling index = Number of IHC positive cells × 100/Total number of cells observed). The two scores were multiplied to get IRS score, ranging from 0 to 12 and corresponded to ≤6 as low and >6 as high groups of p53 expression. The counting was done by two observers and the mean was taken as a final count. The Statistical Package for the Social Sciences software, version 20 (SPSS Inc., Chicago, IL, USA) was used for statistical analyses. The χ2-test and Fisher's exact test were performed to evaluate the correlation between the clinicopathological features of the patients and the p53 expression level. For the survival analysis, the Kaplan–Meier method with log-rank test was used. 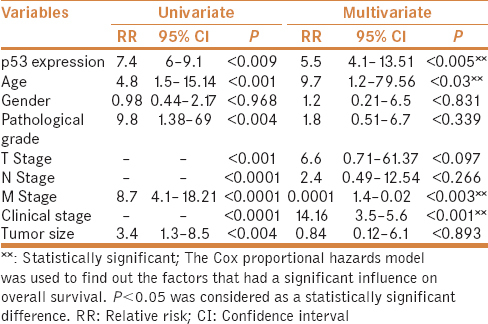 Prognostic factors were further evaluated in univariate and multivariate logistic regression analysis using the Cox's proportional hazards model to know relevant prognostic variables. The risk ratio (RR) with 95% confidence interval (95% CI) was used to assess the relationships between these factors and overall survival. A P value <0.05 was considered as statistically significant. Totally 91 patients of ESCC were enrolled in our study. Among them, 61 (67%) patients were males and 30 (33%) were females with a M: F ratio of 2.03:1. Age range in the study population was 35–80 years with the mean age of 58.5 (SD ± 9.67) years. Mp53 expression was observed in 90% of ESCC patients. Among 91 patients, 90% of patients showed positive Mp53 expression and the remaining 10% of patients showed no expression. According to IRS scoring system 0 to 6 score is considered under low-expression group. Therefore, the 10% of patients showing no expression are considered under low-expression group as per IRS system. Thus, the low-expression group patients were 35 (38.46%) and high-expression group patients were 56 (61.64%). Level of p53 expression was found significantly higher in patients with age group ≥60 years than <60 years (P = 0.023). Similarly, higher p53 expression was found in patients who are betel nut chewers (P ≤ 0.0001). p53 expression was found significantly augmented with higher histological grade of cancer (P ≤ 0.001). Significant correlation was found between p53 expression and higher T stage (P = 0.005), N stage (P = 0.001), and M stage (P = 0.012). As clinical stage of cancer increases, increased expression of p53 was present and has significantly correlated with it (P = 0.004). But no statistically significant correlation was found between gender and p53 expression profile (P = 0.0481) [Table 2]. On Kaplan–Meier survival analysis, patients with p53 high expression had significantly shorter overall survival than those patients with low p53 expression (log-rank P < 0.0001) [Chart 1]. At 12th month of follow-up, 67.89% (CI 0.75–0.97) of patients with p53 high-expression group survived and 91.43% (CI 0.53–0.76) of patients with p53 low-expression group survived. Multivariate analysis by Cox regression model further shows that high p53 expression was an independent predictor of overall poorer survival [heart rate (HR) = 5.5; 95% CI 4.1–13.51, P = 0.005]. It also showed that increasing age (HR = 9.7; 95% CI 1.2–79, P < 0.03), higher M stage (HR = 0.001; 95% CI 1.4–0.02, P < 0.003), and higher clinical stage (HR = 14.16; 95% CI 3.5–5.6, P < 0.001) were found to be important predictors of poorer overall survival. However, gender, histological grade, T stage, N stage, and tumor size were not significant predictors of survival in ESCC patients [Table 3]. Tumorigenesis of ESCC is a complex process which is affected by environmental as well as genetic factors. The exact pathogenesis of ESCC remains unclear; however, various studies indicate it to be multifactorial. Mutations of p53 gene have been observed in many malignancies and are found in ~30–50% of lung, colorectal, head and neck, and ovarian cancers, and in ~5% of leukemia, sarcoma, melanoma, testicular cancer, and cervical cancer patients., This led many observers to study p53 mutation profile meticulously in esophageal cancer patients also. Laboratory analysis of p53 gene was done by three methods: (1) polymerase chain reaction; (2) detection of serum p53 antibody; and (3) IHC. In comparison to DNA sequencing, immunohistochemical methods are cheaper, easier, widely available throughout the world, and more familiar to pathologists as a standard procedure. p53 protein accumulation not only represents mutated p53 gene but also represents effect of other genes on its expression, so expression of p53 needs to be assessed separately for survival prediction. p53 protein expression is variable may be because of using different antibody and different techniques of analysis by different studies. p53 expression is found in about 50–90% patients of ESCC. Previous studies showed 41-87% of p53 positivity in ESCC patients.,,, In our study, we found 90% patients of ESCC showing p53 expression. Yao et al. in 2014 showed that there was insignificant association with gender, in spite of having higher incidence of ESCC in male patients. Similar results were seen in our study. Risk of carcinogenesis increases with increase in age. A study done by Cummings et al. confirmed that age group of >60 years has significantly higher risk for ESCC. Similar results were reflected in our study that p53 expression is significantly higher in age group of >60 years. Areca nut chewing was significantly and independently associated with an increased risk of ESCC in Asians. If fermented areca nut is used or it is used in combination with tobacco, risk for ESCC increases by many fold. When p53 expression was compared with betel nut chewing, we found that p53 expression was significantly high in patients with a habit of betel nut chewing. Similar results were reported by Goan et al. One of the important parameters to assess prognosis in ESCC patients is histopathologic grade of tumor. As grade increases, prognosis becomes poorer. When p53 expression was compared with histopathological grading, we found that p53 expression was significantly increased with increasing grades of histopathology. Similar results were seen by Huang et al. in 2014. Hence overexpression of p53 can be linked with histological aggressiveness of the tumor. Similarly other important parameters are T, N, M, and clinical stage. As the stage increases, patients' survival decreases. On comparing these parameters, we found that p53 expression was significantly increased with increasing grades of T, N, M, and clinical stages (I to IV) [Table 1]. Similar results were seen by Kate Haunget al. Hence p53 expression can also be linked with invasiveness and clinical aggressiveness of the tumor. In our study Kaplan–Meier analysis demonstrated that patients with high p53 expression show significantly poor survival than patients with low p53 expression. This result concurs with the observations of Yao et al. but also contradicts many previous studies, which failed to show association between p53 expression and survival.,, The results of univariate analysis showed that age, pathological grade, tumor size, T stage, N stage, M stage, and TNM clinical stage were significantly correlated with poor prognosis. Additionally, multivariate analysis revealed the age, M stage, clinical stage, and p53 expression were found to be independent variables affecting ESCC patient survival. In conclusion, a significant number of ESCC patients had increased expression of p53, and it significantly correlates with age, betel nut chewing, histological grade, TNM, and clinical stage. p53 was an independent variable affecting the survival. Immunohistochemical analysis of p53 is simple, effective, and reproducible modality that can be used to determine the prognosis and survival in various grades and stages of ESCC. Herszényi L, Tulassay Z. Epidemiology of gastrointestinal and liver tumors. Eur Rev Med Pharmacol Sci 2010;14:249-58. Khuroo MS, Zargar SA, Mahajan R, Banday MA. High incidence of oesophageal and gastric cancer in Kashmir in a population with special personal and dietary habits. Gut 1992;33:11-5. Phukan RK, Ali MS, Chetia CK, Mahanta J. Betel nut and tobacco chewing: Potential risk factors of cancer of oesophagus in Assam, India. Br J Cancer 2001;85:661-7. Bax DA, Siersema PD, Van Vliet AH, Kuipers EJ, Kusters JG. Molecular alterations during development of esophageal adenocarcinoma. J Surg Oncol 2005;92:89-98. Lin DC, Du XL, Wang MR. Protein alterations in ESCC and clinical implications: A review. Dis Esophagus 2009;22:9-20. Shibata-Kobayashi S, Yamashita H, Okuma K, Shiraishi K, Igaki H, Ohtomo K, et al. Correlation among 16 biological factors and clinical outcomes following curative chemoradiation therapy in 10 patients with esophageal squamous cell carcinoma. Oncol Lett 2013;5:903-10.
de Costa NM, Soares Lima SC, de Almeida Simao T, Ribeiro Pinto LF. The potential of molecular markers to improve interventions through the natural history of oesophageal squamous cell carcinoma. Biosci Rep 2013:1-10. Das M, Sharma SK, Sekhon GS, Mahanta J, Phukan RK, Jalan BK. p16 gene silencing along with p53 single-nucleotide polymorphism and risk of esophageal cancer in Northeast India. Tumor Biol 2017;39. Egashira A, Morita M, Yoshida R, Saeki H, Oki E, Kakeji Y, et al. Loss of p53 in esophageal squamous cell carcinoma and the correlation with survival: Analyses of gene mutations, protein expression, and loss of heterozygosity in Japanese patients. Surg Oncol 2011;104:169-75. Liu WK, Jiang XY, Zhang MP, Zhang ZX. The relationship between HPV16 and expression of cyclooxygenase-2, p53 and their prognostic roles in esophageal squamous cell carcinoma. Eur J Gastroenterol Hepatol 2010;22:67-74. Kato H, Yoshikawa M, Miyazaki T, Nakajima M, Fukai Y, Tajima K, et al. Expression of p53 protein related to smoking and alcoholic beverage drinking habits in patients with esophageal cancers. Cancer Lett 2001;167:65-72. Rice TW, Blackstone EH, Rusch VW. Esophagus and esophagogastric junction. Ann Surg Oncol 2010;17:1721-4. Hamilton SR, Aaltonen LA, editors. World Health Organization Classification of Tumours. Pathology and Genetics of Tumours of the Digestive System. IARC Press: Lyon 2000. Gadbail AR, Patil R, Chaudary M. Co-expression of Ki-67 and p53 protein in ameloblastoma and keratocystic odontogenic tumour. Acta Odontol Scand 2012;70:529-35. Fedchenko N, Reifenrath J. Different approaches for interpretation and reporting of immunohistochemistry analysis results in the bone tissue – A review. Diagn Pathol 2014;9:221. Chattopadhyay I. A brief overview of genetics of esophageal squamous cell carcinoma. J Cell Sci Molecul Biol 2014;1:103. Levine AJ, Perry ME, Chang A, Silver A, Dittmer D, Wu M, et al. The 1993 Walter Hubert Lecture: The role of the p53 tumour-suppressor gene in tumorigenesis. Br J Cancer 1994;69:409-16. Kumar V, Abbas AK, Fausto N. Robbins & Cotran Pathologic basis of diseases. 8th ed. Philadelphia: Saunders; 2004. p. 302-3. Agarwal ML, Taylor WR. Chernov MV, Chernova OB, Stark GR. The p53 network. J Biol Chem 1998;273:1-4. Levine AJ, Finlay CA, Hinds PW. p53 is a tumor suppressor gene. Cell 2004;116:S67-9. Hollstein M, Sidransky D, B Vogelstein, Harris CC. p53 mutations in human cancers. Science 1991;253:49-53. Dey B, Raphael V, Khonglah Y, Lynrah KG. Immunohistochemical analysis of p53 and PRB in esophageal squamous cell carcinoma. J Clin Diagn Res 2014;8:FC01-3. Murtaza M, Mushtaq D, Margoob MA, Dutt A, Wani NA, Ahmad I, et al. A study on p53 gene alterations in esophageal squamous cell carcinoma and their correlation to common dietary risk factors among population of the Kashmir valley. World J Gastroenterol 2006;12:4033-7. Ikeguchi M, Oka S, Gomyo Y, Tsujitani S, Maeta M, Kaibara N. Combined analysis of p53 and retinoblastoma protein expressions in esophageal cancer. Ann Thorac Surg 2000;70:913-7. Taghavi N, Biramijamal F, Sotoudeh M, Moaven O, Khademi H, Malekzadeh R, et al. Association of p53/p21expression with cigarette smoking and prognosis in esophageal squamous cell carcinoma patients. World J Gastroenterol 2010;16:4958-67. Yao W, Qin X, Qi B, Lu J, Guo L, Liu F, et al. Association of p53 expression with prognosis in patients with esophageal squamous cell carcinoma. Int J Clin Exp Pathol 2014;7:7158-63. Cummings LC, Cooper GS. Descriptive epidemiology of esophageal carcinoma in the Ohio Cancer Registry. Cancer Detect Prev 2008;32:87-92. Akhtar S. Areca nut chewing and esophageal squamous-cell carcinoma risk in Asians: A meta-analysis of case-control studies. Cancer Causes Control 2013;24:257-65. Goan YG, Chang HC, Hsu HK, Chou YP, Cheng JT. 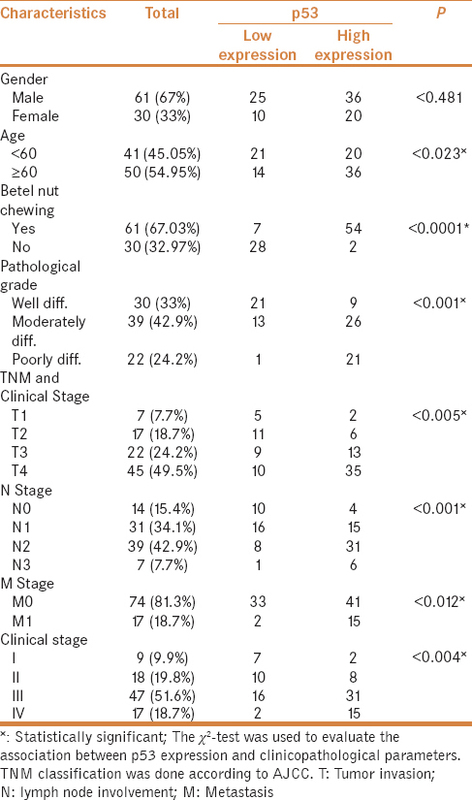 Risk of p53 gene mutation in esophageal squamous cell carcinoma and habit of betel quid chewing in Taiwanese. Cancer Sci 2005;96:758-65. Huang K, Chen L, Zhang J, Wu Z, Lu B, Lan L, et al. Elevated p53 expression levels correlate with tumor progression and poor prognosis in patients exhibiting esophageal squamous cell carcinoma. Oncology Lett 2014;8:1441-6.